The Sycamore tree is a standout, both because of its large size and it’s mottled white bark, that earns it the names of White Tree and Lacewood Tree. The bark of the Sycamore is too rigid to split or furrow as the tree expands (which is what most other trees do). Instead, “plates” of Sycamore bark break off and fall away revealing lovely, massive, white, mottled trunks. Paleobotanists have dated Sycamores to 100 million years ago and some can live 600 years. Native Americans hollowed out Sycamore trunks to make canoes as long as 65 feet. The Sycamore leaves look a lot like Maple leaves or like a hand with 3 to 5 lobes radiating out from the palm. The ball shaped fruit, about the size of a quarter, hang down and look like little buttons, giving rise to the name Buttonwood or Button tree. Goldfinch, Chickadee, Purple Finch, Mallard, Beaver, Muskrat, and Squirrels call the seeds dinner. Sycamore trees have witnessed much significant history including the teaching of Hippocrates, a meeting with Jesus, American Civil War battles and the initiation of the New York Stock Exchange, but I want to talk about only one tree. On the United Nations Peace Day one of the children who survived Theresienstadt planted seeds from this Sycamore at the Beth Shalom Holocaust Museum in Great Britain. And the seeds from this ‘tree of life’ are planted at the Holocaust museums in Israel, Washington D.C. San Francisco, and Philadelphia. Are You Killing Your Lawn with Love? Or water, roots, and air, the under ground story revealed. Watering GuidelinesHow often should I be watering my lawn and trees? I wish we were asked this question more often. Most people do what their neighbors do, sprinkling twice a week or they let their sprinkler maintenance person set the timing. The answer to this important question is simple, but first I have to explain the underground story. Most tree and grass roots inhabit the upper 6 inches of soil. Tree roots do not go down deep. They inhabit and compete with grass roots for that important topmost 6 inches of soil. The reason that most roots stay near the surface is that roots need air. Can you believe it? All living things on earth need oxygen to respire and give off carbon dioxide, even roots. That is why, except for Bald Cypress and Mangrove, trees do not grow in the water. The topsoil that your trees, shrubs, flowers and lawn share is comprised of 50% air space. It is from these micro and macro pores in the soil that your trees and grass get their oxygen and carbon dioxide exchange. If they don’t have open pore space the roots of all plants asphyxiate and die. This can happen in several ways. One, the soil can be compacted by heavy equipment and have all of the air space squished out of it. This is the primary problem that we have to avoid during construction around trees. By the way, most contractors don’t know that 90% of all tree roots inhabit the upper 6 inches of soil and so mistakenly kill most trees. You can read about this in our abstract about preventing construction damage around trees. Did you know that adding just 2 inches of topsoil under a 200 year old Oak can kill it? It is easy to see that in Chicago’s heavy clay soils roots are inhibited. The clay doesn’t allow water to drain through, forcing the water table very close to the surface, drowning any tree roots that try to dig down deep. However, just 40 miles east in Michigan, trucks can park right next to trees and not kill them because water drains right through the sandy soils and the pore spaces can not be squished out of sand. Another way that roots asphyxiate is by having air spaces filled by water when sprinkling the lawn too often. You may actually be killing the lawn and your trees with too much love! Here’s what happens. When the water does not have time to drain away, often taking a week or more, it drowns your grass and tree roots. In effect this overwatering creates a drought intolerant lawn by drowning roots and forcing the surviving roots so close to the surface that they get scorched in the hot weather. Water only during drought. That means when we don’t have rain for more than 2 weeks. Don’t water more often than once a week. Water for about one hour in each zone or the equivalent of about one inch of rain. Water trees once a month for long periods of 12 hours when soil is dry. 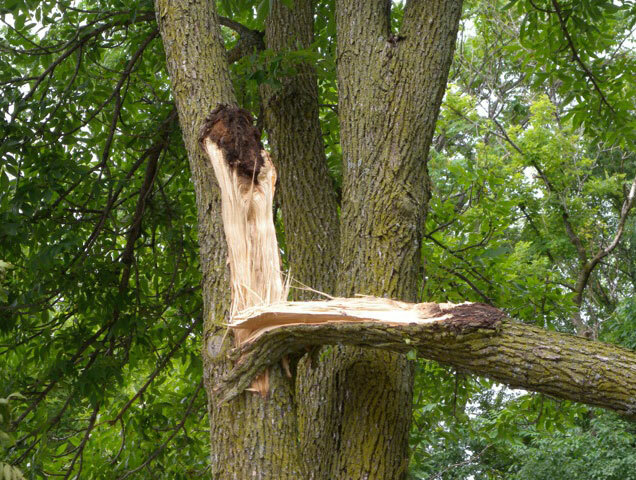 In the wake of all the storms we have experienced in the last several years, it is a valid question to ask, can we prevent storm damage to our trees? When we are in the path of devastating weather events there may be no way to prevent catastrophic damage, but the good news is that MOST storm damage can be prevented and much can be done to protect our trees from these devastating events. So how do we prepare for storms? This is how weak branch unions fail in a storm situation. These trees have been irreparably damaged, this type of catastrophic tree failure is dangerous, destructive and sad. It is also preventable!How do we prevent damage to the trees we love? We discuss this in more detail in our new Storm Damage to TreesAbstract which can be accessed along with the other abstracts listed above using a password available by calling our office.